Questionmark Live, Questionmark’s browser-based authoring tool, makes it easy for subject matter experts to collaborate in writing and editing assessment questions. They can create new questions or import content from elsewhere. Questionmark Live CSV – This is a new format that allows users to quickly create questions in Excel or other text tool that is in the format of a CSV file. The imported questions will be stored in their own question sets, where they can be reviewed and modified before they are exported to Questionmark Perception. 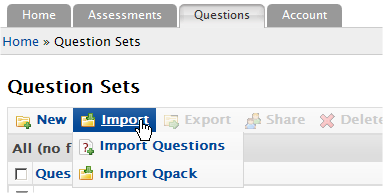 To import questions, go to the Question Sets page and click Import Questions or Import Qpack from the Import menu, then assign a title and description to your question set. You’ll also need to select the format of the questions you want to import and browse to the file you wish to import. You’ll be led through the process of uploading your file to the Questionmark Live server. Once your question set is there you will be able to view and edit the questions just as you would any questions created within Questionmark Live.